The gui has lines to indicate the months of the year. Every day at noon, the shadow of the sun passes the horizontal lines, and shows the season. 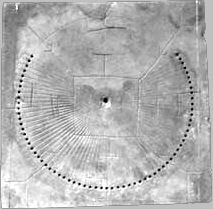 The round sundials of later times had lines emerging from one point, like a fan, indicating the hours of the day. Guibiao with 10 chi Gnomon in the Qing dynasty 圭表 gui1 biao3.Sun'dial' to measure the season of the year. Its direction is exactly North-South. In this photo time is around 10.30 in the morning. At noon the shadow is in the length of the horizontal bar. 日晷 ri4 gui3 (sun cast-shadow) or 日規 ri4 gui1 (sun pattern). 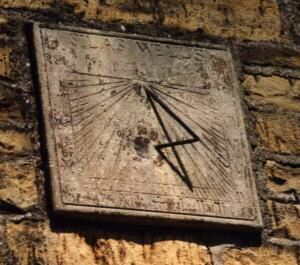 Sundial for measuring the hour of the day. Top points towards the sun. This is only the dial, the gnomon is missing. It can be horizontal, vertical or (like the one at left) slanting.